Millions of children across the country are trafficked or trapped in various forms of exploitation with little hope for freedom. Children are bound either by physical or psychological chains. Every year SBT conducts rescue operations for street children and abandoned children, through its own team or with the support of Childline team. SBT reaches out and protects over 200 children from critical situations such as child labour, trafficking, child abuse etc. On a daily basis, outreach and social workers scourge vulnerable areas such as railway stations, bus stands, market places to be the first point of contact for any child in distress. The urgency to be first point of contact lies in the need to prevent the child from falling into hands of trafficker/abuser and or prevent the child from facing any form of abuse. In this manner on an annual basis, SBT's team rescues over 5000 children from vulnerable situations. 'Every call is important' is the motto of Childline - Salaam Baalak Trust. Launched in 1998, Childline is the first 24-hour national helpline for children, operational under the aegis of Ministry of Women and Child Development. Be it a child labourer thrashed by an employer; a minor abused by a neighbour; a child in pain; or a lost child unable to locate his/her home, Childline- Salaam Baalak Trust - a 24/7 helpline - acts promptly getting a phone call to reach such children within 60 minutes. Childline - SBT now serves through 3 childlines - in two district and one Railway station covering Central district, New Delhi district and Old Delhi Railway Station. Handling more calls than any other zone, Childline- Salaam Baalak Trust works round the clock, effectively responding to calls. The team arranges for the affected child's immediate needs, ranging from emotional support to medical care, shelter and protection prior to presenting a child before the Child Welfare Committee. Once the child is presented before Child Welfare Committee, Childline takes on the task of tracing a child's family or linking him/her to short-stay and shelter homes in consonance with Child Welfare Committee orders. 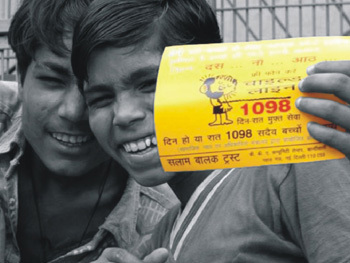 Not limiting its role to providing assistance to children in distress, Childline - Salaam Baalak Trust creates awareness about child rights and its helpline service through open house discussions and awareness programmes conducted at various public spots in the city. Childline - Salaam Baalak Trust synchronises its work with District Labour Department, Indian Railways, Child Welfare Committee, National Commission for Protection of Child Rights, Police, local Non-Governmental Organisations (NGOs) working on children's issues, and other organs of Salaam Baalak Trust. The experience of working with underprivileged children living in various slum communities in Delhi under Chalta Firta School in 2008 - a Sarva Shiksha. An Abhiyan project of Government of National Capital Territory of Delhi - prompted Salaam Baalak Trust to approach urban communities to meet the existing challenges in elementary education. Thus, in 2011, SBT envisaged taking schools to children who couldn't go to school- leading to the birth of the Mobile School as a learning resource for populations with low access to school education. Currently, with support from Children Hope, Mobile School covers children in urban slums in Usmanpur, Seelampur, and Shastri Park. At each of its three stops, the van spends two hours in activities such as television screening, games, non-formal education, group discussions, and counselling on health, hygiene, social skills, and child rights. At the end of each session, supplementary nutrition is also provided, and first aid made available. On Saturdays, our staff organizes sessions on drug de-addiction, the problems of girl children, and HIV/AIDS. With support from Azim Premji Philanthropic Initiatives, SBT aim of mainstreaming street children through inclusive education and skill building. The project works on a holistic approach to empower 600 girls and boys over a period of three years. Salaam Baalak Trust also established an effective partnership with Save the Children to combat the evil of child labor in the city through eight Contact Points - Govind Puri, Taimoor Nagar, Sriniwas Puri, Khirki Village, Subhash Camp, Sanjay Camp, Vasant Kunj, and Kailash Nagar. Working children are linked to mainstream education and vocational training, and their families and communities are sensitized to the issues of child labor. The Project ended in 2016, however, SBT has a long-standing association with Save the Children and we continue to partner on advocacy issues of Street Children. You cannot visit Connaught place and miss the little children selling wares or lying wasted in nooks. With aim of caring and protecting vulnerable children in & around Connaught place, SBT has a Mobile Learning Van which visits three spots - Inner Circle, Shivaji Bridge, and Hanuman Mandir with the aim of reducing child beggary through increasing access to education.